The Lotus Esprit’s initial design was a classic shape, one that Lotus didn’t want to change for a good three decades. 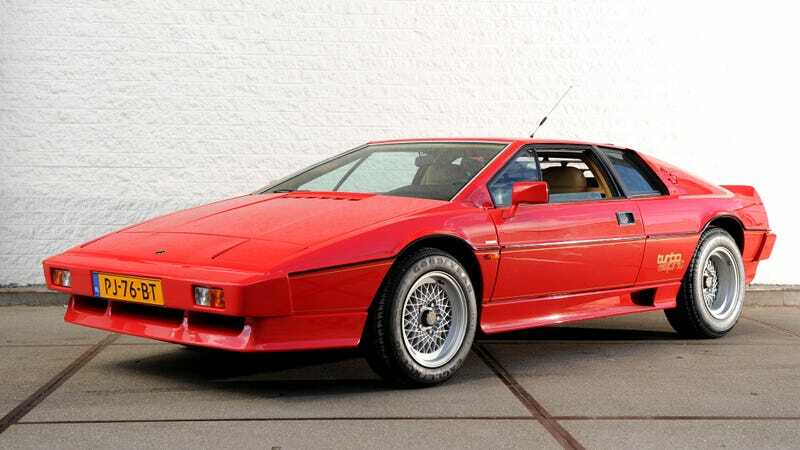 Except when the 1981 Esprit Turbo added a big duck tail spoiler in the back, Lotus designers had to block it with another, smaller hidden spoiler. Why? Too much downforce. Last week, Harry Metcalfe of Harry’s Garage on YouTube uploaded a video featuring his recently-bought 1987 Lotus Esprit Turbo HC, one of the final versions of the Giorgetto Giugiaro-styled Esprit before the smooth and bubbly Peter Stevens 1987 restyling. In the video, Harry claims that the car’s new rear spoiler was too effective at making downforce, pushing the back of the car down too much and leaving the front to lift. The straightforward thing to do would be to get more downforce up front to even out with the rear, but Lotus designers didn’t want to change the styling of the front of the car with more aerodynamic work, and they also didn’t want to lower the ground clearance of the car. But there was too much aerodynamic lift in the front of the car and they had to do something. The styling department didn’t want to change the super cool rear spoiler, either. Who can blame them? The solution was what Lotus called a “trip edge” located at the top of the tailgate, as Harry also points out in his video, which was basically a smaller spoiler at the back of the roof that was designed to effectively blend in with the louvers. This baby spoiler redirected the airflow at the top of the tailgate, so the rear spoiler would operate in a separated airflow, which Lotus admits nullified the spoiler’s effects to a degree. But this helped reduce the aggressive downforce at the back without sacrificing the strong design profile, and managed to balance the car with any sacrifices. I reached out to Lotus to confirm the story, with the hopes of getting a more detailed explanation. According to Lotus, the progressive stepped rear louvered tailgate coupled with the aggressive duck tail rear spoiler on the 1981-and-later Series 3 Esprit Turbo didn’t just look cool, but it did in fact generate a lot of downforce. Too much downforce, initially, despite the Esprit Turbo’s front air dam, so the reduction at the back was needed. It’s a clever solution, and also not something I could really see an automaker striving to do today—I think either too much would be added to counter the problem or they’d just get rid of the stylish spoiler altogether. But it seems like Lotus was hell-bent on keeping the cool style flourishes of the car, and it’s very much appreciated.